PT Alpine Ant and Termite Foam comes from a new line of Reduced Risk Non-Repellent products which means effective pest control with a safer active ingredient. Non-repellent products are un-detectable to insects and have a transfer effect allowing the insecticide to spread throughout a colony to kill even the pests you don't see! With Alpine Foam you can treat subterranean and drywood termites, including termite swarm sites and localized termite infestations in wall voids and other areas. In addition, Alpine Foam treats ant infestations (including foraging carpenter ants, argentine, ghost, pharaoh and white footed ants), powderpost beetles, asian lady bugs, boxelder bugs and more. 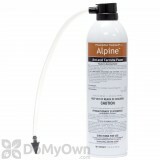 Alpine Foam expands at a rate of 30:1 with 1 oz. of product (or 5 seconds of spray) producing approx 1 quart of foam. The can will produce up to 20 quarts of foam. Apartments, Food/Feed Handling Establishments, Homes, Hotels, Hospitals and Nursing Homes (Non-patient Areas), Motels, Restaurants, Hobby Greenhouses, Interiorscapes, Office Buildings, Schools**, Transportation Equipment (Buses, Boats, Ships, Trains, Planes***), Warehouses and Other Commercial and Industrial Buildings. *** DO NOT use in aircraft cabins. This product was used by my termite pest control provider so I started using it myself on areas where I find termite droppings,so far seems to work well.I live on a 1951-built house . Alpine Ant and Termite Foam - This stuff WORKS! The beauty of this foaming crack & crevice product is the fact that ants do not avoid it, instead tracking through it and bringing it back to their nest... Proof is that we observed (and killed) several staggering ghost ant queens abandoning their nests - these ants had been plaguing us for a while, and no other product had managed to control the little buggers (pardon the pun). At first glance, product appears expensive, but the degree of expansion of the foam means that a little bit actually goes a long way. Highly recommended, without hesitation or reservation. We found evidence of dry termites in the front door jamb of our home. I ordered Alpine Ant and Termite Foam and it was delivered in one week as promised by Customer Service. We drilled holes in the door frame and injected the termite foam. Be sure to hold the nozzle at the injection site firmly until the flow stops. You can possibly end up with lots of foam outside the wall if you remove the nozzle too quickly. Due to the extent of wood damage, I am having a professional termite company further inspect and repair / replace the door frame. The day of the inspection, the termite company found no active termites (3 days after I treated with Alpine). More information will be posted once the wall is opened and the inspector can see if the Alpine killed the active colony. So far, it appears Alpine is working. More to come. I used half a can and I have not seen another termite. I would surely recommend this product to others. Does the Alpine Ant and Termite Foam go into the wall as a foam and then turn to powder? Is the main ingredient boric acid? I recently saw on TV someone using a spray for ants that goes into the wall and becomes a powder which is brought back to the nest. I thought they said it was Boric Acid powder and environmentally friendly. The Alpine Ant and Termite Foam does go into wall voids but it does not turn into a powder, it actually becomes a clear residual product once it dries that can be picked up by ants and termites and taken back to the nest. The active ingredient is Dinotefuran .025%, not boric acid powder. Alpine is very environmentally friendly. We do carry a Boric Acid Powder dust called CB Borid Boric Acid Dust which would fit the description of what you are describing. I have drywood termites in a painted patio post. Should I use Alpine foam or Fastout Foam? or something else? I can see the kickout hole. Would I drill a hole directly into the kickout hole or several holes around the area? The Alpine Ant and Termite Foam is our most popular product, so we would suggest that product. You should drill directly into the kickout hole and foam into the drill holes. Simple as that. Can Alpine Foam get rid off any type of termites if applied properly? Alpine Ant and Termite Foam will kill any type of termite that comes into contact with it, however it is not the proper way to eliminate subterranean termites and will not eliminate an entire subterranean colony on its own. Proper application of the foam for drywood termites or spot treatments in a wall void for subterranean in conjunction with a soil foundation treatment will be effective with the Alpine. Can Alpine Foam (or another Foam) be used in conjunction with Termidor to treat for termites? 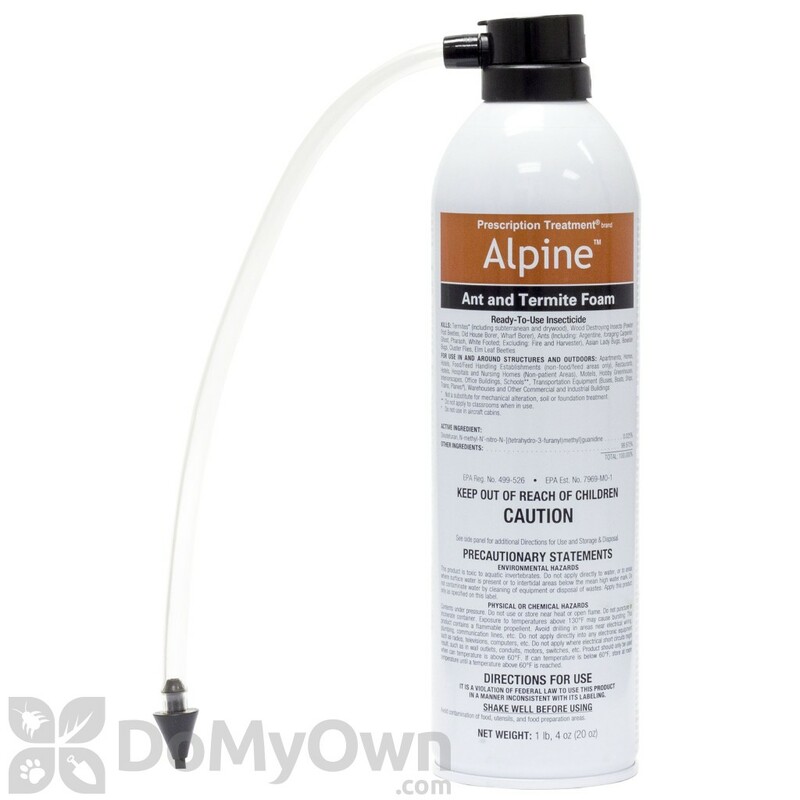 Can Alpine Foam (or another Foam) be used in conjunction with Termidor to treat for termites (ie: Termidor outside and Alpine Foam indoors to treat a wall void where a swarm occurred)? Yes, since Alpine Ant and Termite Foam is also a non-repellent, it can be used in conjunction with Termidor with no issues. It would be advised to treat as you stated, Termidor outside and Alpine foam inside the structure. I have ants moving behind the walls of my kitchen and emerging in different places. Alpine or D-Foam? Alpine Ant and Termite Foam would be a great option for you. It provides a non-repellent transfer killing effect to eradicate the ant colony/colonies.